Support for 1.2TB SFF 6G SAS10K Enterprise, 4TB LFF 3G SATA 7.2k Midline; and up to 800GB SATA ME Hot Plug SFF/LFF Enterprise SSD drives. NOTE: Mixing different processor models is not supported. NOTE: All processors support up to 1600MHz DDR3 memory speeds. NOTE: The second processor must be installed to take advantage of the optional 3-slot riser. NOTE: Depending on the memory configuration, the memory speed may run at 1600MHz, 1333MHz, 1066MHz or lower. Please see Memory Population Table or the Online Memory Configuration Tool at: www.hp.com/go/ddr3memory-configurator. One of the following depending on Model HP ProLiant Gen8 servers offer a new networking technology - FlexibleLOM. The HP ProLiant DL385p Gen8 server offers the customer the choice of 1 Gigabit and/or 10 Gigabit networking solutions. For additional details see the Networking Section of this document. Only one FlexibleLOM may fit on a single server - see PCIe solutions for additional networking. NOTE: Not Available on 8+8 LFF, 12LFF or 25SFF Models. NOTE: Optional 2nd 8-SFF drive kit requires 2nd Smart Array Controller (PCIe) for support recommend HP Smart Array P420 PCI card). NOTE: For best performance on the 25 Small Form Factor drive cage where less than 25 drives are installed you will need to balance the drives on the backplane's two expanders. Drive bays 1-12 are on routed to expander 1 and drive bays 13-25 are routed to expander number 2. Example: if a customer purchases 16 drives, they should split 8 drives on expander 1 and 8 drives on expander 2 for optimal performance. NOTE: HP ProLiant DL385p series servers offer both LFF and SFF versions. The optical drive bay is not available with +8SFF drive bay upgrade, 12-LFF, or 25-SFF drive bay models. NOTE: 8-LFF, 12-LFF, and 25-SFF versions are not upgradeable options from the standard 8SFF model, or vice versa. NOTE: Storage capacities may vary depending on Models/Drive Cages and Hard Drives selected. To review typical system power ratings use the HP Power Advisor which is available via the online tool located at URL: www.hp.com/go/proliant-energy-efficient or www.hp.com/go/hppoweradvisor. NOTE: All pre-configured BTO Models ship with Ball-Bearing sliding rails and cable management arm. Any customer configured models through HP CTO must select the appropriate Rail Kit when configuring. HP Insight management HP Insight Control HP Insight Control, a product option, delivers essential infrastructure management that can help save time and money by making it easy to deploy, migrate, monitor, remote control, and optimize your IT infrastructure through a single, simple management console. HP InsightControl also supports Location and Power Discovery Services to automate many configuration, asset tracking, and power management tasks to speed implementation and prevent downtime. For more information, see http://www.hp.com/go/insightcontrol. The HP Matrix Operating Environment (Matrix OE) for ProLiant and Integrity servers is an integrated command center that helps you instantly adjust to dynamic business demands. This advanced infrastructure management software lets you reduce the cost of common data center tasks by up to 40 percent while keeping pace with your changing business. Warranty / Service Coverage For ProLiant servers and storage systems, the services cover HP-branded hardware options qualified for the server, purchased at the same time or afterward, internal to the enclosure, as well as external monitors up to 22" and tower UPS products; these items will be covered at the same service level and for the same coverage period as the server unless the maximum supported lifetime and/or the maximum usage limitation has been exceeded. Coverage of the UPS battery is not included; standard warranty terms and conditions apply. NOTE: Up to 24 DIMM slots available with 2nd Processor installed (12 DIMM Slots per processor). NOTE: 3 additional PCIe slots available with optional PCIe Riser Cage #2-requires second processor. NOTE: The HP 2U Gen8 Cable Management Arm is not available when using Friction Rails. To assist in the installation of the server into the rack an optional installation tool is available by contacting your local services representative (p/n 695539-001). Caution: HP recommends that a minimum of two people are required for all Rack Server installations. Please refer to your installation instructions for proper tools and number of people to use for any installation. NOTE: This Model is Energy Star Certified. NOTE: Up to 24 DIMM slots available with 2nd Processor installed(12 DIMM Slots per processor). NOTE: Includes PCIe Riser Cage #2. Additional PCIe Slots may be added with the 2nd Riser Cage option. NOTE: Smart Array Cache options, Hard drives, Optical drives, Flexible NICs*, Power Supply* and Rail/CMA Kits not included in the base configuration - choose these from Steps 2 or 4 below in Options section. Additional 8-SFF Drive option requires additional HP Smart Array Controller. * This is a required selection. NOTE: Smart Array Cache options, Hard drives, Optical drives, Flexible NICs*, Power Supply* and Rail/CMA Kits not included in the base configuration - choose these from Steps 2 or 4 below in Options section. NOTE: Smart Array Cache options, Hard drives, Flexible NICs*, Power Supply* and Rail/CMA Kits not included in the base configuration - choose these from Steps 2 or 4 below in Options section. HP Processors NOTE: All processors support up to 1600MHz DDR3 memory speeds. 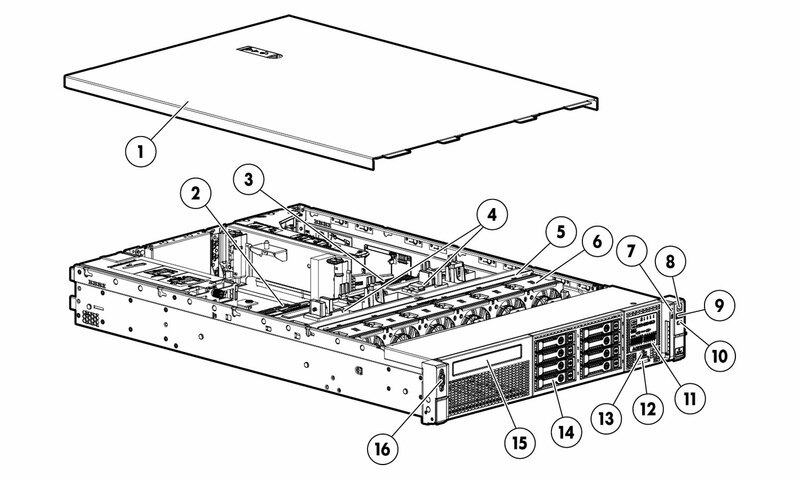 NOTE: The HP ProLiant DL385p Gen8 server requires one FlexibleLOM to be installed in the FlexibleLOM slot. HP Rack Kits NOTE: Rail kits are optional for Gen8 and are no longer included standard with the server (except pre-configured/BTO Models). The customer has the choice to not include rail kits with their server purchase, but it is recommended. NOTE: HP 2U Ball Bearing Rail Kits provide full serviceability of the server while in the Rack and include a CMA. HP 2U Friction Rail Kits ARE NOT serviceable in the Rack and must be removed from the rack and do not include CMA. NOTE: Additional HP Rack Kit options can be found in "Step 4: Additional Options, HP Rack Options - Rail Kits" section of this QuickSpecs. Only FIO options are listed here. NOTE: To assist in the installation of the server into the rack an optional installation tool is available by contacting your local services representative (p/n 695539-001). Caution: HP recommends that a minimum of two people are required for all Rack Server installations. Please refer to your installation instructions for proper tools and number of people to use for any installation. NOTE: With upgrade of 8SFF Cage/Bkpln, there is no Optical Drive support. NOTE: With upgrade of 8SFF Cage/Bkpln, an additional storage controller is required. Please go to the Storage Controller section for options available. NOTE: 2nd Riser Cage requires 2nd Processor. HP Hard Drives NOTE: The HP ProLiant DL385p Gen8 Smart Storage solutions are equipped with entirely re-designed Small Form Factor (SFF 2.5 in) and Large Form Factor (LFF 3.5 in) hot plug carriers for HP Qualified Hard Drives and Solid State Drives. These new carriers provide status, location and activity indicators as well as caution indicators for "Do Not Remove". NOTE: Insight Management DVD media without licenses. Contains HP Systems Insight Manager, HP Insight Control, HP Matrix Operating Environment, and Virtual Connect Enterprise Manager software. An integrated installer to perform quick and accurate software installation and updates. NOTE: Rail kits are optional for Gen8 and are no longer included standard with the server(except pre-configured/BTO Models). The customer has the choice to not include rail kits with their server purchase, but it is recommended. Each AMD Opteron family processor socket contains four memory channels that support three DIMMs each for a total of twelve (12) DIMM per installed processor or a grand total of twenty-four (24) DIMMs for the server. Up to 32GB capacity DIMMs are supported for 768GB of memory (24 DIMM slots x 32GB per DIMM). to load the channels similarly whenever possible. RDIMMs and LRDIMMs are supported up to 3 DIMMs per channel. The DL385p Gen8 RBSU has options to set memory for Performance or Power modes. In Performance Mode all memory whether 1.35V DIMMs or 1.5V DIMMs will be set to 1.5V. In Power Mode all memory whether 1.35V or 1.5V will be set to 1.35V for power savings. The maximum memory speed is a function of the memory type and memory configuration. features such as memory authentication and enhanced performance may not be supported. To realize the performance memory capabilities listed in this document, HP SmartMemory is required. For additional information, please see the HP SmartMemory QuickSpecs at: http://h18000.www1.hp.com/products/quickspecs/14225_div/14225_div.html. For memory population rules and additional memory guidelines, please see the DL385p Gen8 user guide at http://www.hp.com/support. 4 LRDIMM capable of 3 DIMMs per channel. Sixteen SFF SAS hot plug drive bays. Built-In Smart Array manages first 8 drives. Requires 2nd Smart Array Controller for second option of 8 drives. NOTE: This configuration does not support SID or optical drive. Eight LFF SAS hot plug drive bays. NOTE: This configuration supports a pop-out SID. Acoustic Noise Listed are the declared A-Weighted sound power levels (LWAd) and declared average bystander position A-Weighted sound pressure levels (LpAm) when the product is operating in a 23°C ambient environment. Noise emissions were measured in accordance with ISO 7779 (ECMA 74) and declared in accordance with ISO 9296 (ECMA 109). The listed sound levels apply to standard shipping configurations. Additional options may result in increased sound levels.